Can your police chief write like this? Lincoln Police Chief Tom Casady is known by reporters for being a quote machine. He’s known for being able to use any kind of computer technology you can come up with. He’s also known for saying what he thinks, whether it’s controversial or unpopular. Turns out, he can write, too: Read this blog he wrote about the death of a former officer of his, Vicki Bourg, whose last assignment was working as a school resource officer at Northstar High School. Whether I agree with what he says or not, i love his candor, and willingness to communicate outside his office in this way. 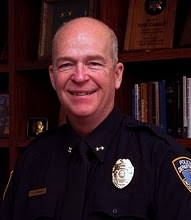 Chief Casady will be very difficult to replace should he ever decide to retire. Hoping he’s mentored the next generation of leadership to serve Lincoln the way that he has so faithfully served. That was a very eloquent tribute to a wonderful young woman. He has proven that he can capture goodness. We are fortunate to have a chief like Tom and to have had an officer like Vicki! That was very well said. I got choked up, and I never had the pleasure of meeting this fine lady. RIP, officer Bourg.